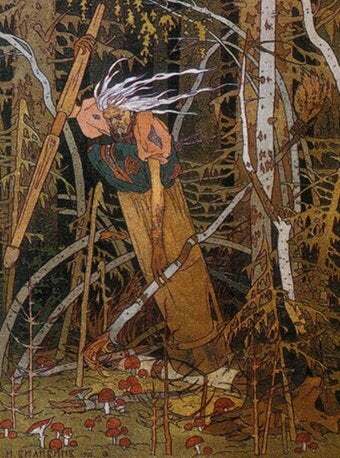 It's not hard to see that Baba Yaga, the horrifying witch-hag of Slavic folklore, could be read as saying a lot of things about women. A new retelling of her myth does exactly that. she lives deep in the forest in a hut that runs about on chicken legs and turns away from visitors so that they can't find the door; the hut is fortified by a palisade surmounted by skulls ‘with eyes intact'. She has one skeleton or metal leg, half-blind bloodshot eyes, and dugs so long she slings them over the rafters when she goes to bed. She travels through the air in a pestle and mortar, using a broom to sweep away her tracks. But her bark is worse than her bite, and several stories, including Ugrešić's, have her using her magic powers on behalf of strays or her protégés. Baba Yaga has been a figure of fascination for many writers (see - seriously - Angela Carter's The Old Wives' Fairy Tale Book.) In the newest, Baba Yaga Laid an Egg, the latest in Canongate's excellent (and highly-recommended) series of reimagined myths, author Dubravka Ugrešić plays loosely with the literal witch-myth, but explores a lot of larger questions about identity, storytelling and what the LRB terms "the horror and terror old women inspire." The review continues," Old women do more complicated symbolic work in literature and myth than males in their third age. Much disgust and joyless moralising has been provoked by their continuing sexual appetite after the end of fertility." And that Baba Yaga is conflated with a chicken no less can't be coincidental! A similar but smaller construction was used by Siberian pagans to hold figurines of their gods. Recalling the late matriarchy among Siberian peoples, a common picture of a bone-carved doll in rags in a small cabin on top of a tree stump fits a common description of Baba Yaga, who barely fits her cabin: her legs lie in one corner, her head in another one, and her nose is grown into the ceiling...There are indications that ancient Slavs had a funeral tradition of cremation in huts of this type. In 1948, Russian archaeologists Yefimenko and Tretyakov discovered similar small huts with traces of corpse cremation and circular fences around them; this may be a connection to the Baba Yaga myth. When Baba Yaga is approached without good preparation, sincerity, and due respect, she is dangerous. When too many questions (or the wrong questions) are asked, she is also dangerous. Only by maintaining pure heart and faith, proper respect for her as one's elder, and loving care of her creatures can the encounter be successful.